In real-world sewing, shirring refers to two or more rows of gathered fabric that is sewn together. Shirring is often used to decorate waistbands, bodices, sleeves, cuffs and sometimes other parts of clothes. Elastic waistbands of pants and skirts often appear to have a shirred effect as well. Shirring often creates a stretchy garment. Here to the right are some example images of shirring used on real clothes. Shirring is usually made using regular thread and elastic thread, pins and a sewing machine. There are several ways to create a shirring effect and many shirring tutorials exist on the Internet. In the creation of digital 3D clothing shirring can be accomplished by applying a Displacement map or Normal map when rendering the 3D clothing models in a render engine. Shirring maps for digital 3D clothes are made from a Photograph of a real shirred fabric, processed in a photo editing software such as Photoshop to create a tiling texture and then used to create Normal Maps and Displacement maps by using a 3D Map Generator software. See here an example of how a shirring CG texture is used in an Octane Standalone render scene. Follow CG Elves’s board Real-World Clothing Reference Images on Pinterest. 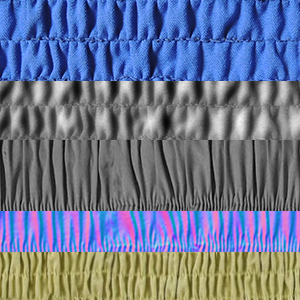 Example of 3D Normal maps and Displacement maps made for tileable shirring textures for digital 3D clothes renders.